One of the last lectures in an introductory physics course is usually a description of the photoelectric effect. This is because the effect is a beautiful manifestation of one of the astonishing discoveries of modern physics; that light, known to behave as an electromagnetic wave, can in some circumstances behave as a stream of discrete particles. The first hint of this dual nature of light arose from Planck’s study of blackbody radiation in 1900 (see post on radiation). Planck found that he could only predict the observed spectrum of radiation from a hot body if it was assumed that the radiation was transferred between the body and the walls of a container in tiny, discrete packets or quanta of energy, each quantum having an amount of energy given by E = hf ; here f is the frequency of the radiation and h is a fundamental constant of nature (extremely small) that became known as Planck’s constant. This assumption was regarded as something of a puzzling mathematical trick until a young Einstein suggested in a famous paper that it was the light itself (as opposed to some transfer process) that was quantized i.e. the blackbody spectrum could be described by assuming that light was behaving like a stream of extremely small, discrete bundles of energy, each of energy E = hf. This was a bold assumption as the wave properties of light were well established, but Einstein backed up the idea by showing it explained several other puzzling phenomena, not least the photoelectric effect. 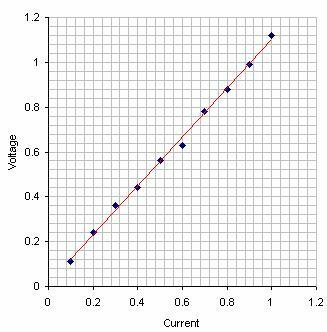 The photoelectric effect was a well-known phenomenon whereby light incident on a metal could cause electrons to be released by the metal (measurable as an electric current). A great puzzle was that the effect ocurred only for light above a certain frequency, characteristic of the metal under investigation; this result was completely inexplicable in terms of the familiar wave theory of light. where each incoming photon of light has an energy of hf and W0 is the binding energy (or work function) of the metal. Clearly, electrons could be released from the metal only if the incoming light was of a frequency such that hf > W0 , irrespective of the intensity of the radiation! Could it be that simple? The experimentalist Phillipe Lenard disliked Einstein’s idea intensely and set about disproving it in a series of experiments; years of careful experimentation showed that Einstein’s theory was exactly right in its predictions (see here for more details). The explanation of the photoelectric effect was a significant breakthrough in physics as it represented the first unequivocal evidence of duality; the phenomenon whereby light can behave as a wave in some situations and as a stream of particles (or quanta of energy) in others. This duality formed a cornerstone of the new quantum theory and was later found to be a universal truth of the microworld – entities known as ‘particles’ such as electrons and even atoms were in turn found to exhibit wave behaviour. Indeed, the quantum equation E = hf is as important in modern physics as E = mc2 and it was for his explanation for the photoelectric effect (not for special or general relativity) that Einstein was awarded the 1921 Nobel Prize in physics. 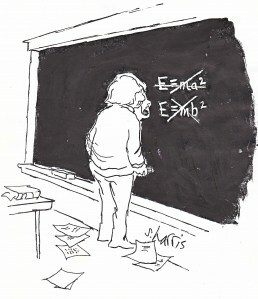 Philosophers and journalists often claim that ‘Einstein disliked quantum theory’. It should be clear from the above that Einstein was one of the major pioneers of quantum physics; his view of quanta of light was far ahead of its time and was at first strongly resisted by the scientific establishment (including Planck). What Einstein disliked was a later interpretation of quantum theory known as the Copenhagen interpretation, a view of the quantum world that is still debated today. A spectacular application of the phenomenon of refraction (see previous post) is the lens. Just as a focusing mirror is used to obtain an image of a distant object (see post on mirrors), a lens is used to focus light by refraction. The difference is that the light is transmitted through a lens – it is refracted once entering the lens and again as it passes out again. Lenses are cut from parabolic surfaces in such a way that distant rays are brought to a focus at the focal point. 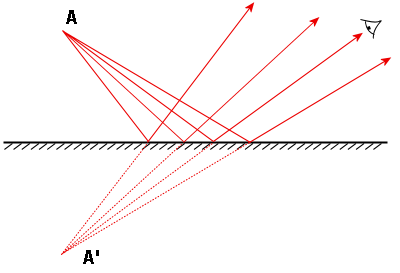 As with mirrors, there are two types of lenses, depending on the curvature of cut: a convex lens causes parallel rays of light to converge to a real focus, while a concave lens cause the light to appear to diverge from a virtual focus. (Note that for a distant object u = ∞ and hence v = f ). The magnification m of the image can be calcuated from the equation m = –v/u, as before. Lenses are used extensively in everyday life. The most common example is of course spectacles. No one knows when spectacles were first invented (12th century? ), but they have been used throughout the ages to improve defective human eyesight. Typically, spectacle lenses are concave (diverging) lenses are made from glass or plastic. This is because the most common eyesight defect is myopia (shortsightedness), a condition where the natural lens of the eye focuses too strongly i.e. an image is formed short of the retina. A diverging lens of the right strength placed in front of the eye will cause the image to be projected back on the retina as normal. In the case of hyperopia (the longsightedness that occurs commonly in older people), the eye muscles are weakened and an image is formed beyond the retina; this is corrected by placing a convex (converging) lens in front of the eye in order to strengthen it i.e. shorten the focal length of the eye’s natural lens. A modern application is the contact lens: this operates on the same principle as above, but the lens is made of a soft fabric that can be worn directly on the pupil. A third option nowadays is laser surgery; in this case the focal length of the eye’s natural lens is adjusted directly (and permanently) by laser treatment. Lenses played a pivotal role in the development of science. In the 17th century, advances in lens technology led directly to the invention of the microscope, a device that revolutionized our view of the world of the very small: and to the development of the telescope, an invention that revolutionized our view of the solar system and ultimately the entire universe. 1. If an object 5 cm high is placed 30 cm in front of a convex (converging) lens of focal length 20 cm, calculate the position and height of the image. Is the image real or virtual? 2. As a shortsighted person ages, can the onset of longsightedness cancel myopia? Light can be refracted as well as reflected: in refraction, light is transmitted, but changes direction as it passes from one medium to another. This familiar phenomenon occurs because light has different velocities in different media. The behaviour can be explained using wave theory but luckily the main results can be described using simple geometrical optics. Note the reversibility of light: if a ray bends closer to the normal upon entering water, it bends further from the normal upon leaving it i.e. all the diagrams work in either direction. One consequence of refraction is the phenomenon of apparent depth; essentially, this means that a pool of water is deeper than it appears. From the simple diagram below, you can see why (remember the observer sees the image as the intersection of the two diverging beams). The apparent depth is always shallower than the real thing, so perhaps it should be renamed apparent shallowness! It is just as well nature works this way round – if water was shallower than it appears, children would crack their heads every time they dived into a swimming pool. A curious phenomenon can occur when light travels from a dense medium to a less dense one. 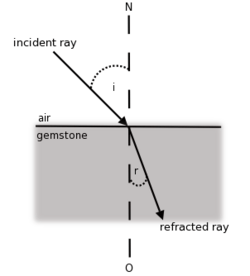 Since a ray of light is bent away from the normal as it enters a less dense medium, it follows that at some critical angle of incidence, the refracted ray can be 90 degrees to the normal, i.e. travel along the boundary between the media. Further, rays at angles of incidence larger than the critical angle will not transmitted at all, but reflected back into the first medium. This phenomen is known as total internal reflection; the phenomenon is exploited heavily in telecommunications, where waves are transmitted undiminished over large distances in optical fibres. 1. If a ray of light enters water from air at an angle of incidence of 60o, calculate the angle of refraction from the table above. 2. If a person looking down vertically into a pond sees a fish apparently 18 cm below the surface, calculate the actual depth of the fish in the pond. Focusing mirrors are mirrors cut from a parabola of reflecting material; the parabola is fabricated in such a way that distant rays will be bent through a single point i.e. the focus of the mirror. In fact, there are two types of curved mirrors; converging mirrors made from parabolas that are concave in shape , and diverging mirrors that are made from parabolas that are convex. In either case, the focal length of the mirror is half the radius of the sphere from which it is cut. From the diagram below, you can see that in the case of a converging (concave) mirror, parallel rays are focused down to an image at the focal point (this is the point of such a mirror). In this type of mirror the rays reflected by the mirror actually pass through F and it is therefore a real focus. By contrast, parallel rays appear to come from a focal point behind the mirror in the case of a diverging mirror. i.e. the focus is virtual. These rules are not mysterious but smply a result of how the mirrors are fabricated. In the diagram above, note that the object is close to the converging mirror, but outside of the focal length. Using the first 2 rules above, the intersection of the reflected rays gives the position of the image. You can see the image is inverted and diminished. Note: in using both the above formulae, we use the convention that any distance that is real object is taken as a positive. Actually, focusing mirrors are cut from parabolic surfaces, not spherical ones – I forgot this. See comment below by Norman. 1. 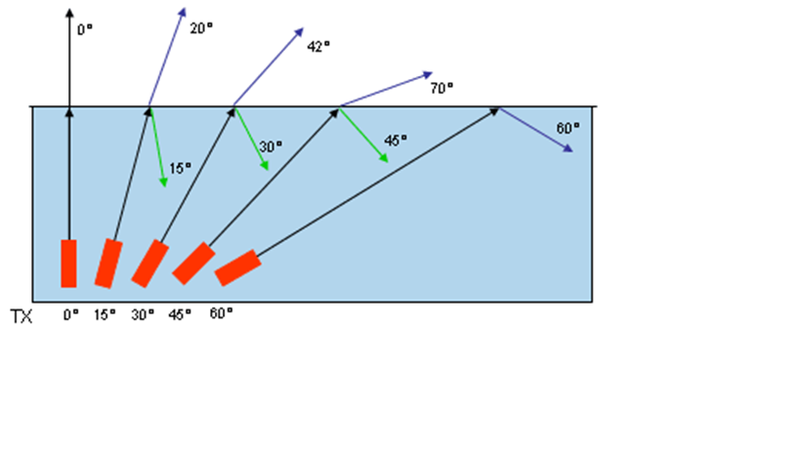 An astronomer is observing a distant star with a reflecting telescope: use the mirror formula above to calculate where the photographic plate should be positioned. What kind of magnification can one expect? 2. If an object 5 cm high is placed 40 cm in front of a converging mirror of focal length 20 cm, calculate the position and height of the image. Is the image real or virtual? The macroscopic properties of light had been studied for many years before its quantum properties were known. Such properties include transmission, reflection and refraction; the study of these phenomena is known as geometrical optics. For example, it was realised centuries ago that light travels in straight lines (unlike sound): this can be demonstrated by placing a few pieces of cardboard with pinholes in their centres in a line. On placing a light source in front of A, the light will only be transmitted if the three pinholes are in a straight line. Using one pinhole, one can form an image of a distant object as shown below: this is the basis of the famous camera obscura. Rays of light can be convergent, divergent, or parallel. Rays emerging from a source diverge (think of a child’s drawing of the sun); on the other hand, rays arriving at an observer from a distance arrive parallel. Most useful of all, it was soon realised that a good image of an object could be got by causing incoming rays to converge using optical instruments – more on this later. When light falls on a smooth highly polished surface it is reflected i.e. turned back on its path. A piece of polished metal, or indeed any shiny object makes a good reflector. [One reflecting material that is very much in the news at the moment is ice. The arctic is currently experiencing a global warming more pronounced than anywhere else in the world; this is thought to be caused by the fact that, as the polar ice cap gradually melts to water, it causes a reduction in the reflection of sunlight (water does not relect heat and light very well). This in turn causes further warming, an effect known as a positive feedback loop]. In reflection, a ray of light emerges at the same angle it went in (technically we say the angle of incidence equals the angle of reflection, where both angles are measured relative to the normal to the surface at the point of contact); this makes reflection images rather easy to draw (see below). Virtual images are images which are formed in locations where light does not actually reach. Light does not actually pass through the location on the other side of the mirror; it only appears to an observer as though the light is coming from this location. (The opposite is a real image; a real image can be focused on a screen, whereas a virtual image can not). In the case of the plane mirror the image is virtual because the rays APPEAR to be diverging from a point behind the mirror.